I think now, more than ever, parents are heavily invested as to where their kids attend school, and schools are also a significant factor when researching homes at your new duty station. For my husband and me, it was easily one of the top two issues for our move this past summer. I joke with my siblings about how different it was in the early 1990s when our parents moved us to a new state without even a thought as to what the schools were like. They liked the house, bought it, and then thought, Hmm...I wonder where the kids’ schools are? Luckily, research techniques have changed so much that a quick internet query can point you in the right direction. Military families also have the advantage of actually choosing their top picks for schools and then setting out to find that perfect home for the next few years. I feel that is a very good benefit amongst the other negatives that military relocation can cause. 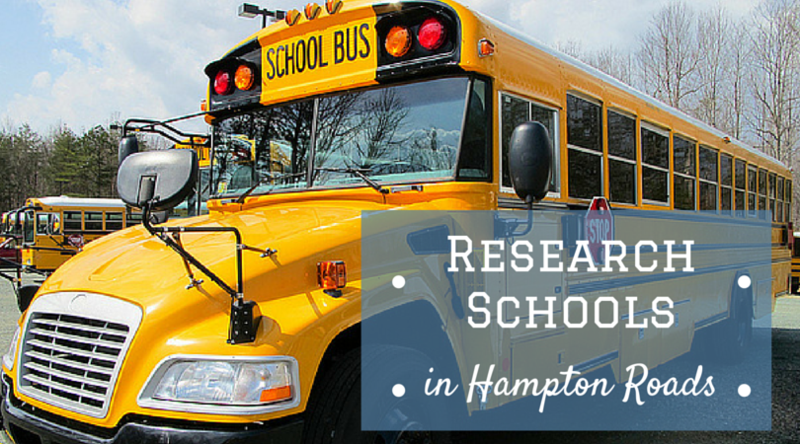 In general, it's not difficult to understand school boundaries in the Hampton Roads area because each city's name is in the title of the school system. For example: Norfolk is Norfolk Public Schools System, Virginia Beach is Virginia Beach Public School System, Portsmouth is Portsmouth Public School System, and so on. Cameron also makes these suggestions about schools and their associated military bases. She details these options in the PCS Guide. There isn’t any way around it, you have to sit at the computer and take a few hours to read reviews, statistics, and reports about schools you are considering. First things first, however, you must start with a geography lesson and understand the location of your base, important zip codes, and which schools are available to your new address. I also strongly encourage beginning your search with your potential school system’s home page. They should provide boundary maps or information on how to find which schools your address allows. Take it from me, this is important! When renting a home in one state, the property manager assured me it was districted for the school we wanted. Not true. The even numbered addresses on our street were, but not the odd numbered addresses. With our odd-numbered house, we were slated for an elementary school further away. For better or worse, social media is here to stay, so use it to your advantage to reach out and ask for firsthand knowledge of the schools you are considering. Military families in particular love to share their experiences and thoughts about their kids’ schools. Read the school and neighborhood reviews at MTA and then contribute your knowledge of schools you have used. I used this technique to amass a list of three schools I would be happy with and started my housing search from each school’s boundary indicator and key zip codes. Word of mouth advice from friends is invaluable, but so is online information from SchoolDigger and GreatSchools. They provide statistics, reviews, and the all-important school boundary maps. GreatSchools has been around since 1998, and is often the first place many families begin their investigation. However, SchoolDigger has quickly become a competitor since its beginnings in 2006 and adds an additional resource for families to explore. Which in this scenario, the more information, the better. SchoolDigger has a unique search feature that provides the top 10 schools in the state, as well as the bottom 10 in state rankings. What I find more compelling however, is the option to view those schools who are what SchoolDigger names “most improved.” This would be so useful if unsure about an average rated school. With a "most improved" designation attached, it might be a school worth considering. Pete Claar, founder of SchoolDigger, designed the site for parents to be able to search a thorough, user-friendly experience when looking for K-12 public and private schools. In his encounters with other school research sites, they were not accurate, filled with advertisements and difficult to navigate. In response, Claar continues to be very hands-on with the site and is involved with all avenues of SchoolDigger, to include coding, database maintenance, marketing and customer service. Whatever type of schooling you choose for your children--public, private, charter, or homeschooling--there are many great resources out there to guide you in your search for the next schoo. Good luck and enjoy your new assignment!